William Alexander Percy erected the monument in the 1930s in loving memory of his father, Leroy, a lawyer and senator, Mississippi statesman and Delta planter. The Norman Knight stands silently above the graves of the Percy family in Washington County, Miss. William Alexander Percy erected the monument in the 1930s in loving memory of his father, Leroy, a lawyer and senator, Mississippi statesman and Delta planter. It is appropriately a Norman Knight. Long ago Percy ancestors lived in the village of Percy in Normandy, France, before joining the conqueror, crossing the channel and ultimately settling in northern England. More immediate to the Percys of Washington County, though, Sen. Percy’s wife, Camille, was herself the daughter of French émigrés. 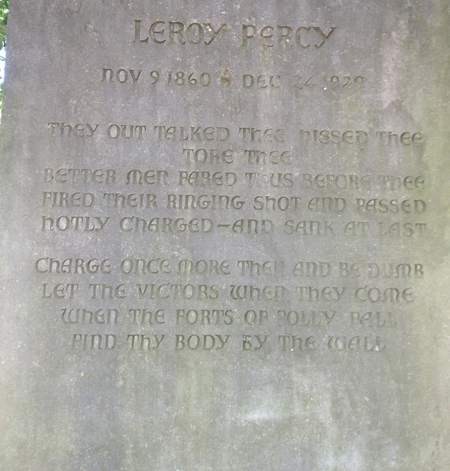 In a sea of surrounding Protestantism, Leroy Percy raised his children as Roman Catholics. Percy also ensured Washington County too would have a diverse population, bringing in immigrants from all over the world to work the Delta, tend its needs, and make the Mississippi Delta into the vastly more interesting place that it remains today. Sen. Percy fought battles just as his family had fought before him to clear the Delta out of a wilderness. Leroy Percy fought to save Greenville from the devastating flood of 1927, but clashed with his son William Alexander over what should become of the thousands of black tenant farmers brought in to work and live on the threatened levees in ever more desperate conditions, drawing national criticism. But Leroy Percy earlier in 1922 had also led the fight to keep the Ku Klux Klan out of Washington County. No battle though, had been at once more noble or disheartening than the earlier still Democratic primary battle of 1911 resulting in the loss of Leroy Percy’s Senate seat to James K. Vardaman, the “Great White Chief,” a man whose violently racist rhetoric was regarded as shocking even for the age. Vardaman denounced Percy for advocating education for blacks and improvement in racial relations. For Mississippi’s honor and the sake of her history, Percy’s battle with Vardaman was a battle that Percy had to fight on the stump before often rowdy and hostile crowds, enduring the hurt and humiliation brought upon him by forces of prejudice and ignorance that ultimately proved even more powerful than he. My wife and law partner, Suzanne, and I stopped by the Percy memorial after trying a case in the Washington County Courthouse. As lawyers ourselves we felt drawn to this spot after court in Greenville because Leroy and William Alexander Percy were the most prominent lawyers in Washington County of their time. We paid our respects to Leroy and William Alexander Percy as they rested in their graves, the greenish-black stones carefully carved with Celtic borders and crosses, signs along with the Knight of their Norman heritage. Leroy Percy, by speaking the truth when truth in Mississippi at the moment was difficult, honored his calling as a statesman and as a lawyer. Percy spoke the truth even as his immediate battle with Vardaman was not only lost, but at the time with honor, could only be lost. The Norman Knight of the Percy memorial stands today as a source of inspiration and solace for Mississippians who, like Leroy Percy, may find they are called upon to fight for whole truths in our state before forces even more powerful than themselves – forces that will find those truths inconvenient and difficult in the moment: and to give themselves wholly to the fight for those truths at whatever the victory, or like the Norman Knight by the wall, for whatever the loss. Robert Wise is a Northsider.